Although often considered the stuff of conspiracy theories, suspicious deaths appearing prominently in the so-called Clinton body count deserve closer scrutiny than a dismissive roll of the eyes — particularly when discrepancies occur years after a name has been listed. As Hillary Clinton’s obstreperous opponent has reminded the country frequently throughout his campaign, perhaps the most legendary name appearing on the list is Vince Foster — the details of whose suicide remain an irritatingly open question for establishment Democrats intent on installing Hillary in the White House. Now, adding to previous conjecture over the Clintons’ actions following Foster’s suicide, Ronald Kessler exclusively reports for the Daily Mail that key FBI documents from an investigation into the untimely death of the former Clinton law partner have inexplicably vanished — from the National Archives. Kessler, a former investigative journalist for the Washington Post and Wall Street Journal, reports that on two occasions, he visited the National Archives and Records Service in College Park, Maryland, for the express purpose of viewing FBI agents’ reports and documents generated during a week of investigation following Foster’s untimely 1993 death. 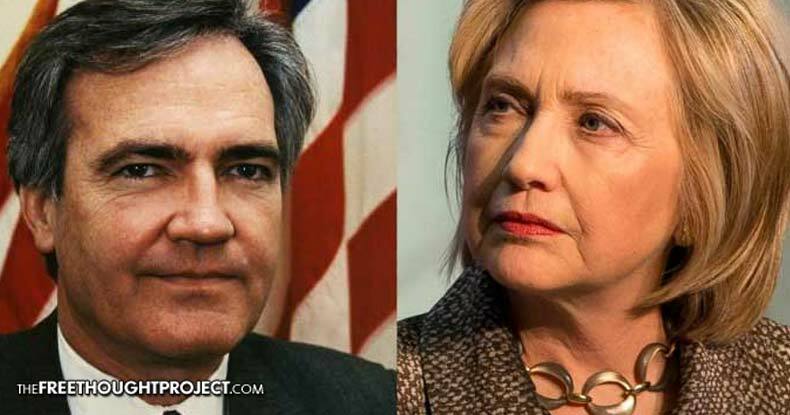 According to Kessler’s account, which albeit remains unverified at this time, a box of documents provided upon his second visit to the Archives contained all relevant information from the FBI and other investigators — but was absent “reports on Hillary Clinton’s role” in the suicide of Vince Foster. Despite Murphy’s statement none of the appropriate records could be located, John Valceanu, Archives’ director of communications and marketing, disputed Kessler’s assessment the documents have disappeared. “We do not agree with your conclusion that the records you requested are missing from the National Archives simply because we were unable to locate any responsive records in response to your request,” Valceanu stated, according to Kessler. Valceanu further noted some 7.5 million pages in more than 3,000 boxes generated during the investigation of the Clintons over the Whitewater real estate development scandal by Kenneth W. Starr and the FBI could easily contain the appropriate documents, filed incorrectly. Again, notably, because no documentation was made available by Kessler or the Daily Mail, verifying the accuracy of his FOIA request pursuant to obtaining the documents in question is impossible. However, no plausible reason to doubt his account exists, either — and Kessler has been investigating the Foster suicide for some time, writing several articles about pertinent open questions relating to the Clintons’ role before and after the death. Though establishment Democrats and their corporate media mouthpieces wholly decry suspicions concerning Foster’s suicide as purely fictitious conspiracy theory, several pertinent details prove there’s more to the story deserving attention. FBI agents investigating Foster’s untimely demise interviewed Bill Clinton White House aides and several members of Foster’s family, and learned that one week prior to his self-inflicted fatal gunshot, Hillary Clinton held a large meeting with Foster and top aides to parse out her proposed healthcare legislation. Things took an ugly turn when Foster raised a legal question, and Hillary went on the offensive — reportedly deriding the attorney in front of everyone present, according to former FBI agents Coy Copeland and Jim Clemente in interviews with Kessler. Copeland served as Starr’s senior investigator, and thus read accounts by other agents on the probe. Both Copeland and Clemente told Kessler that Clinton mercilessly ridiculed Foster throughout the meeting at the White House. Foster, who already exhibited signs of depression prior to the meeting, took Clinton’s vehement criticism in front of his peers quite personally, and began to withdraw, even mentioning thoughts of resignation to his wife. “Foster was profoundly depressed,” Clemente explained, “but Hillary lambasting him was the final straw because she publicly embarrassed him in front of others. Foster and his wife spent time with friends not long afterward, but he seemed reserved and humorless — and altogether uncharacteristically withdrawn. After returning to work, on July 20, 1993, Foster left the White House parking lot at 1:10 p.m., drove to Fort Marcy Park bordering the Potomac River, sat down with his back against a tree, and shoved a gun in his mouth, pulling the trigger. Park Police discovered Foster later in the evening and reported his death to the Secret Service. An exact time of death was never determined. Remember, this information was found by Starr’s own FBI investigative team — so his willful omission of apparently pertinent information appears wholly incongruent with the exhaustive scope of his report. Now, if what Kessler intimates turns out to be true — documentation of Hillary’s surmised catalyst role in Foster’s choice to end his life has vanished from the National Archives — the missing information takes on abrupt importance. Starr never told Copeland or Clemente why he chose to leave out potentially damning information from his report, and did not return Kessler’s request for comment. A spokesman for Hillary Clinton also had no comment for the article. Although the more conspiracy-minded have suggested Foster did not actually commit suicide, but instead became the victim of unknown government-associated assailants, Starr and a number of ballistics and medical experts thoroughly refuted that rumor long ago — Foster did, in fact, take his own life. But the details of why he did so, as well as rumors Hillary Clinton or her other associates removed sensitive files from Foster’s office and briefcase after his death, have never been fully substantiated — or disproven. Nonetheless, the arbitrary disappearance — or significant misplacement — of documents directly concerning the suicide of Vincent Foster should certainly raise the eyebrows of anyone following the Clinton personal email server scandal. Without suggesting a direct connection, of course, documents and Hillary Clinton have a unique way of separating themselves from one another.